ทำไมต้องใช้เครื่องวัดพื้นที่ ? " 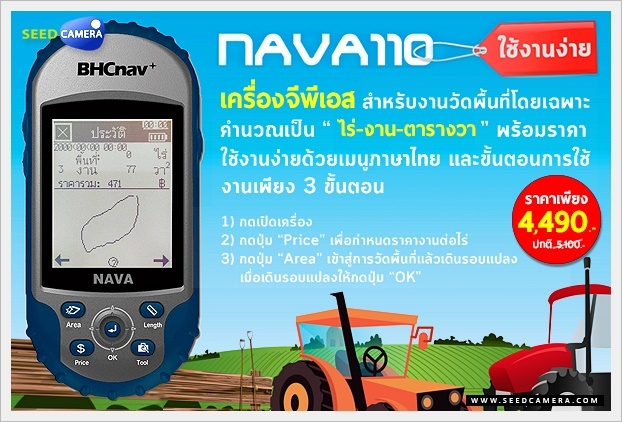 จากปัญหาที่ลูกค้าเจอมาว่าทำไมต้องวัดพื้นที่... "
• NAVA 110 Land Measurement GPS is a new high-tech product independently researched and developed by BHCnav, which is functioned with Area & Length & Circumference & Price setting & Total Fare Calculation. • It measures the length, width and area of the farm through satellites, and also has the function of unit price set and fare calculating. • The product has been widely used in many agricultural activities for its creative handheld design and high performance and price ratio. • NAVA 110 Land Measurement GPS is a very helpful tool for users’ outdoor land measurement. It enjoys high reputation from users especially from forestry and agriculture.